Over the 2nd and 3rd of April, 2016 we held a flood hackfest event (referred to on social media as #floodhack2016). The goal of a hackfest is to create an environment where a group of people can come together in the same space and collaboratively work on the same project, problem or topic. 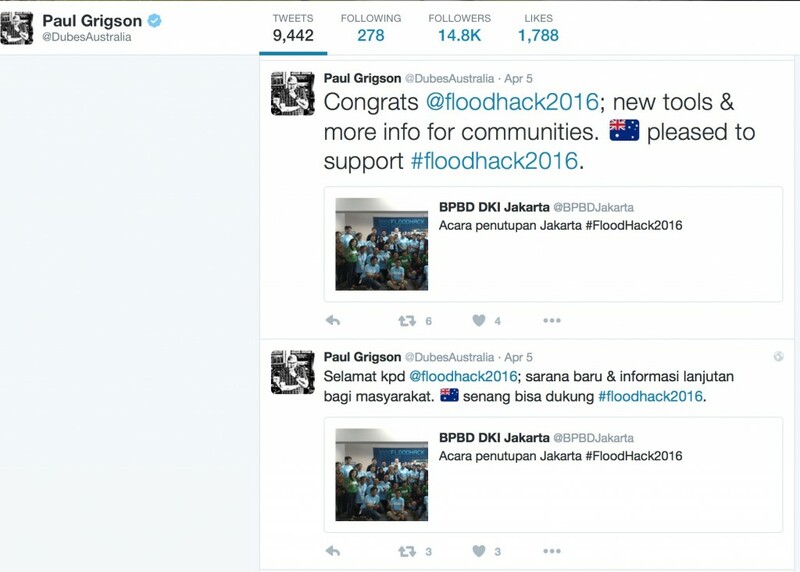 In Jakarta there are annual floods during the monsoon season and we held #floodhack2016 with the intent of seeing how technology, data and open collaboration can be marshalled to improve understanding of flooding, reduce the incidence of flooding, reduce the impact of flooding and improve the response to flooding. This event was conceived and planned by DMInnovation and Kartoza with partnerships from BPBD-DKI (Jakarta’s Provincial Disaster Management Agency), BNPB (National Indonesian Disaster Agency), Australian Aid, DMInnovation, WorldBank-GFDRR, Kartoza, the Humanitarian OpenStreetMap Team, University of Wollongong SMART Infrastructure Facility and UN-OCHA. There are many different ways a hackathon can be convened. For this event format we aimed to hold a cross disciplinary event where disaster managers, GIS professionals, software developers, data experts and others with expertise that can be applied to the field of flooding could work together in a collaborative environment. We split the attendees into multidisciplinary and cross-organisational groups with the intent of stimulating conversation and sparking new ideas through the diversity of people in each group. 34 participants from around 20 organisations formed into 5 teams. 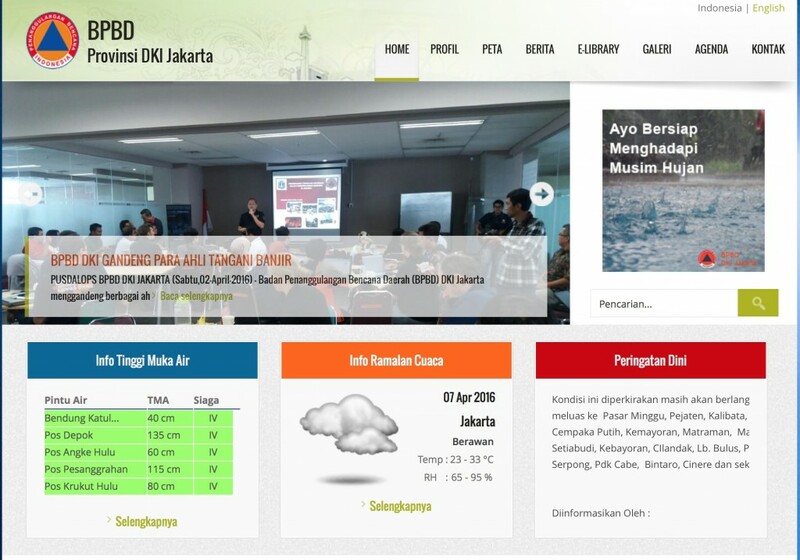 In the first part of the event the teams were given a collection of data useful for understanding floods in Jakarta. A briefing session was held where the participants were introduced to a number of the datasets and API’s and also to the unfolding timeline that happens during a flood. The teams were then given some time to explore the data and API’s and come up with a problem formulation which would guide their work through the event. Pak Bambang, from BPBD-DKI consulted with each team to provide some insight into the usefulness of their ideas and some guidance as to how to optimise ideas. 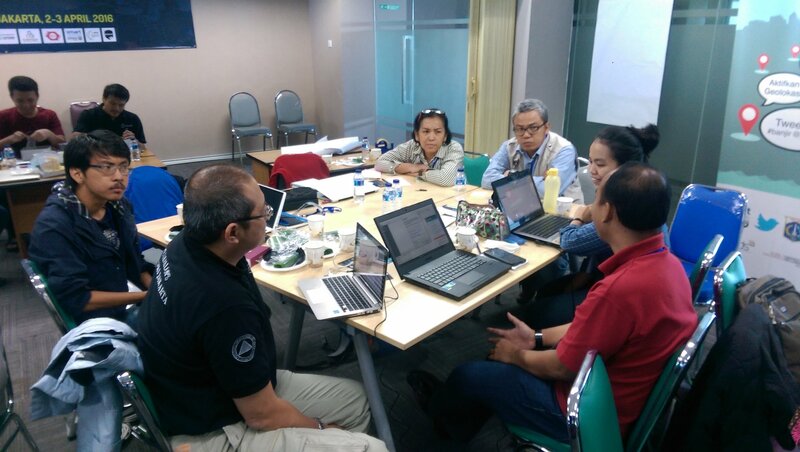 Pak Bambang (foreground left) of BPBD-DKI giving one of the teams advice on their concept. Next it was time to hack! With 24 hour access to the venue kindly provided by BPBD-DKI the teams worked late into the night, with some even taking the opportunity to sleep over in the venue in their sleeping bags on camping mats on the floor. Then first thing in the morning they were back at work, with an event deadline of midday for completion of the work sprint, there was a lot to do and little time to do it! Which Areas in Jakarta Are Most Vulnerable? The first team (‘Flood Ninjas’) presented an approach to mapping vulnerability of neighbourhoods in Jakarta using multi-criteria data analysis (density of roads, buildings, population etc.). These were then cross referenced to flood frequency for neighbourhoods. The idea was to provide a simple approach to identify which neighbourhoods are most vulnerable and likely to be adversely affected by floods so that amelioration efforts could be concentrated in these areas first. The second team (‘Go Flood!’), proposed an approach for centralised management of the water infrastructure. The approach could be used during flooding to provide a systematic way to manage flood gates in order to lower overall damages. They simulated different scenarios for how the infrastructure is set up to find the optimal configuration of the infrastructure. You can see an example of a scenario where a hypothetical flood gate is introduced here. The third team (‘Richard’s team’) designed a concept mobile app for Jakarta residents to use during a flood event. In their concept they propose the idea of a personal information hub on your smart phone that will allow you to report on the ground conditions, view maps of current flood conditions, find an optimal route from their current location to an evacuation centre that avoids flooded areas, and generally have current and relevant information relating to the flood all in one place – on their phone! The fourth team (‘Fantastic Four’) also produced a mobile application concept design. They proposed an application that will alert citizens about floods using an audio alert on their phone. They also developed a routing prototype that would be used in the phone app for helping citizens to find routes to evacuation centres without needing to traverse a flooded area. Their routing prototype used the QGIS InaSAFE and Road Graph plugins. The fifth team (‘Team AER’) produced a mobile application concept called ‘AER’ – Application for Emergency Response. In their concept they propose a way to connect displaced people with individual donors offering help and donations. Using location data from the two user groups (affected people versus donors) the app aims to optimise the distribution of help by connecting donors with people in need that are close by. Thanks to generous sponsorship from DMInnovation and WorldBank-GFDRR the winning teams were presented with great prizes – action cams for the overall winner, quad-copters for the runners up and all participants were given a google cardboard compatible Virtual Reality device. We really hope they find new and interesting ways to use their prizes to improve our response and understanding of floods in Jakarta in the future. As a special treat, some participants received ‘door prizes’ from our sponsor Rensus – makers of overshoes that can be worn by people passing through flooded areas. Building prototypes and mockups is great, but what does it all mean at the end of the day? Addressing the issues around flooding is not a trivial task. Creating an incubator for innovative ideas where people from different disciplines can combine their skills to think of new ways to address flood related issues is a fantastic way to adopt a progressive approach to dealing with floods. An event like #floodhack2016 provides a forum for individuals from different organisations to collaborate, form bonds and gain a personal understanding of how floods are perceived and addressed by their counterparts in different organisations. From InaSAFE’s point of view, the experience was invaluable – the event provided a great insight into the kinds of problems people wish to solve and potential avenues for future development down the line. One other benefit of the floodhack is worth mentioning – there was a lot of buzz around the event, with activity on social media and in traditional media and it really served to focus attention on the possibilities in better planning for floods offered by smart use of data and cross collaboration between organisations. We were really thrilled to have the Australian ambassador tweeting about the event and the BPBD posting a nice article about the event on their web site! If you want to find out more about the event, check out these links!